Juan Villarreal (also see below) and Yvette Quintero, shown left and center, with "Mortales" creator-writer-director-producer Kevin Martínez at right in the photo at right, were big winners of the Mortales Awards this year. The awards honor the actors of the popular Dominican anthology television series "Mortales" (which can be seen internationally on the Telemicro network). 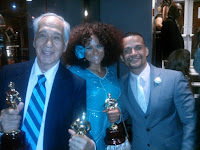 Quintero won an award for Best Comic Actress, while Villarreal won two awards, for Best Dramatic Actor and Best Male Actor, respectively. The feature film Medardo (written by and starring Julio Ortega, based on his award-winning stage play of the same name, and directed by Nitsy Grau Crespo) will be making its Ecuadorian premiere in movie theaters on Friday, June 5, 2015. In addition to Ortega, the film (which was shot in Ecuador) stars Lupita Ferrer, Edna Lee Figueroa, Juan Villarreal (also see above), Edison Carrera, Gloria Ospina, Fior Marte, and Inma Heredia. For more information, click here. Jason Torres has been cast in the television pilot "Eden" (written by Erik Wegner and directed by Steve Rahaman).